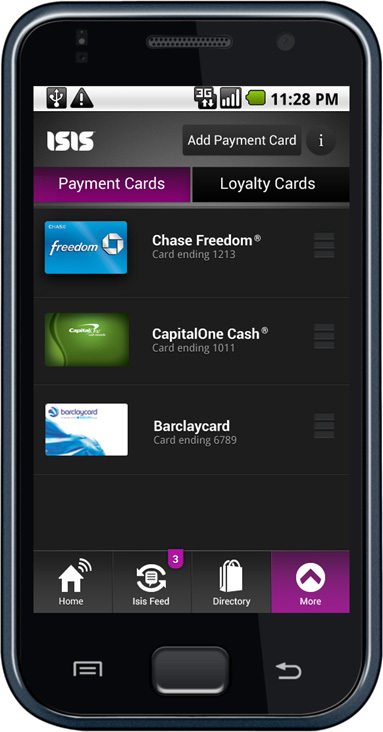 This morning, T-Mobile announced that a new update for the Galaxy S2 would include support for Isis, the mobile wallet app that they have teamed with AT&T and Verizon to create. For months, Isis news had cooled, but today is apparently the day for it all to come out. Bloomberg is reporting that Isis’ CEO has said that they are planning for a launch in their first markets, Austin, TX and Salt Lake City, next month. This is technically a delay, but the slow rollout has to do with a change in approach from having carriers process payments to putting that side of the business on the credit card companies. In related news, we have a list of devices on each carrier that MasterCard has given Isis approval to. The list isn’t extensive, but then again, NFC equipped phones haven’t exactly started flooding the market yet as mobile payment systems like this have taken their sweet time. For Verizon, we get the Incredible 4G and Galaxy S3. The Galaxy Nexus is not listed. Soooooo, if Verizon won’t allow Google Wallet to work on it and MasterCard won’t give it Isis approval, where does that leave us? Now all we need is for this trial period in SLC and Austin to take place so that the rest of the country can get in on the fun.